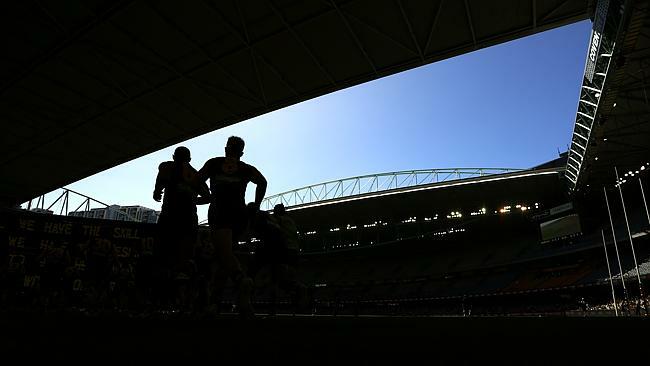 THE AFL remains determined to keep the roof open at Etihad Stadium on sunny days, despite copping a backlash from players and coaches. Football operations boss Mark Evans yesterday conceded the partially-closed roof experiment at Saturday’s early Richmond-North Melbourne game didn’t work, but was encouraged by the results in the Carlton-Geelong twilight match. Regardless of the partially-closed trial, Evans said the league’s much-debated policy of keeping the roof fully open in dry weather would remain in place for the start of the season. Coaches Chris Scott, Damien Hardwick and Brad Scott all argued over the weekend that the roof should be fully shut, while ruckman Todd Goldstein said he struggled to see the ball at centre bounces. “It’s not that hard is it?” Hardwick said on Saturday. “Here’s an idea, shut the bloody thing! Jesus, I just reckon ask the players. The players would say shut it. But Evans said the league would consult the fans, via a 11,500-strong survey this week. “We always try and balance up all needs. It’s fair to say we’ve heard from coaches and players and broadcasters,” Evans said. 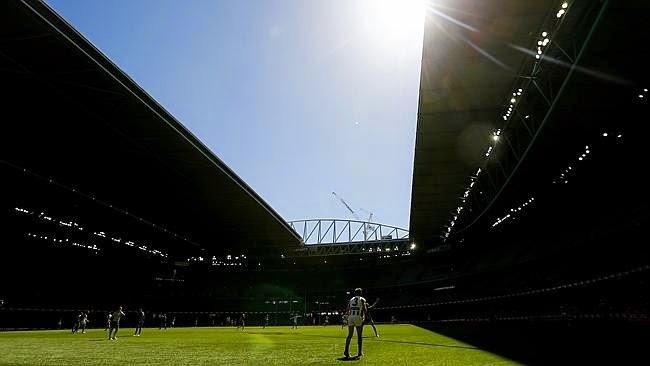 The Herald Sun Footy Fans Survey last year asked 20,000 supporters whether the Etihad roof should be closed for all matches. More than 58 per cent said it should be shut. Asked if the AFL should be concerned when a player says he can’t see the ball, Evans said: “There might also be players in the West Coast and Fremantle game who would say the same thing and we only have the debate here because there is a roof and I can understand that. “I think we’ve had a debate for quite a while about the shade on the ground and we just wanted to see if a partial closure would assist that or not. “It’s fair to say we’ve never trialled a partial closure before. On Saturday it didn’t appear to do too much for us, it might even have made it a bit worse. The Sunday game, the later start, it seemed to be a little more beneficial. The league was encouraged by the NBA-style 30-second shot clock displayed on big screens, but Evans said its introduction for the season-proper would depend on whether every venue was capable of displaying it.